I had made one in my last entry..
the rest of the card is mostly things bought at the dollar store..
they all have something to share. Wow, that is such an impressive 3-D tree! Gorgeous card! Thanks so much for joining us at Merry Monday. 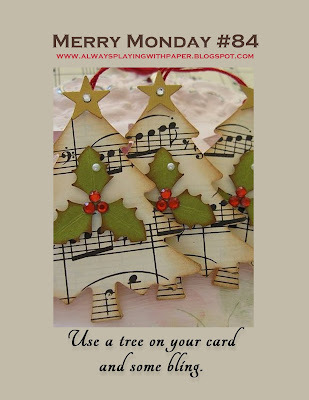 Lovely card Judy, your colourful tree is fantastic. Thank you for joining us for Merry Monday. Hi Judy. Your origami tree is gorgeous. The papers you used are so fun and bright. Thanks for joining us at Merry Monday. What pretty paper and I love how the "balls" are so perfectly lined up! Thanks, Judy, for sharing this with us at Merry Monday! What a clever tree...very pretty! I love those papers! 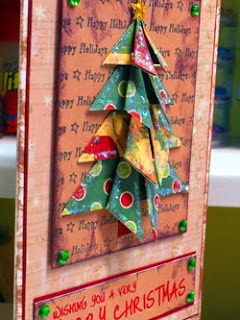 Thanks for sharing this with us at the Merry Monday challenge! How clever and creative! Thank you for joining us at Merry Monday! 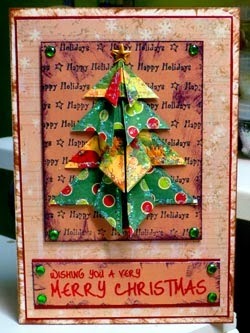 I also LOVE your snowman card.I love the added pieces that stand out. :)I haven't tried flocking yet..although I have seen Christy do it once or twice. Great idea! I know I don't get over here as often as I use to..but I think of you often!